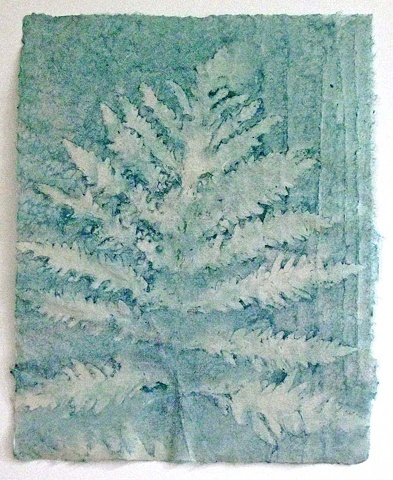 I used a sensitive fern and grasses to form the patterns of this paper painting. I sprayed green-pigmented cotton pulp across the natural materials lying on a wet base sheet of kozo paper to form the image in this artwork. A similar, but not identical image in a lime-green, is on the reverse side of the paper. This piece was part of a series of approximately two dozen 11" x 14" fern papers (in shades of green) that may be used as prints, background for other prints, or by book artists. Please contact me for additional information.